A list of Airlie Beach hotels, motels and serviced apartments that provide quality accommodation in Airlie Beach and around the Whitsunday Islands at cheap, budget prices. Budget stay give you the ability book directly with these Airlie Beach hotels and apartments and make sure that your next holiday in the Whitsundays of Queensland is not only memorable but also comes at the cheapest possible rate. The Airlie Apartments provides a range of 1, 2 & 3 bedroom self contained apartments accommodation, welcoming you to Australia's premier holiday destination, Airlie Beach and the Whitsunday Islands. With a great, central location close to everything that Airlie Beach has to offer the Airlie Apartments is a popular accommodation for travellers of any budget. 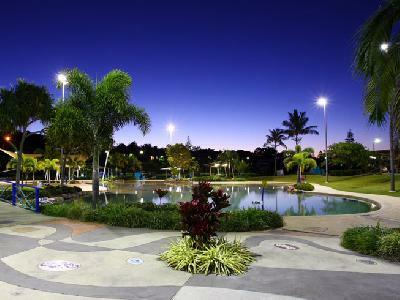 This Airlie Beach property features a wide range of accommodation and facilities like free car parking, guest laundry, massage, outdoor swimming pool, tour desk, bbq facilities, landscaped garden, airport shuttle, baby cots available for families and babysitting service, which makes it a popular place to stay with all types of travellers. With easy access to everything in Airlie Beach and the surrounding precincts because of its central location the Airlie Apartments offers travellers a range of Airlie Beach accommodation just a short distance from the Great Barrier Reef, Whitehaven Beach, fishing, barefoot bowls, charter boats, sailing adventures, cafes, restaurants, night clubs and bars. The cheap holiday accommodation at the Whitsunday On the Beach consists of spacious studio apartments situated right next to Airlie Beach Lagoon. This makes the Whitsunday On the Beach the perfect base from which to explore everything that Airlie Beach and the fabulous Whitsundays has to offer. With easy access to all of the major tourist attractions in the Airlie Beach region the Whitsunday on the Beach is the ideal place for your next budget accommodation. It also features numerous guest services and facilities including free car parking, guest laundry, outdoor swimming pool, tour desk, bbq facilities, airport shuttle and baby cots available for families. With a central location in the Airlie Beach business and holiday travellers who choose to stay at the Whitsunday on the Beach will find themselves only this far from the following attractions swimming, bush walking, a multitude of water sports, quad biking, laser skirmish, tours to the Great Barrier Reef, Whitehaven Beach and Whitsunday Islands. Flametree Tourist Village offers 3.5 star budget studios, self contained apartments & caravan park cabins nestled amongst 7 acres of shady tropical gardens. The Flametree Tourist Village Airlie Beach Holiday Apartments are located 5 mins from Airlie Beach city centre, next to Conway National Park & only 4 mins drive from Shute Harbour, the gateway to the 74 Whitsunday Islands. Staying at the Flametree Tourist Village in Airlie Beach allows you to make the most of the many guest facilities at this affordable property, including the direct internet access, disabled facilities, guest laundry, pets allowed, outdoor swimming pool, tour desk and BBQ facilities. The Club Crocodile Resort is a multi-award winning tropical resort that provides couples, families and individuals with a wide range of discount accommodation in Airlie Beach, Queensland. When staying at this budget resort hotel guests can experience the magnificent Whitsunday Islands or the wonders of the Great Barrier Reef, which are just a short ferry ride away from Club Crocodile Resort Airlie Beach. With a variety of quality facilities set amidst pleasant, relaxing surroundings you should book now for a holiday, honeymoon or conference that you won't soon forget. Accommodation in our hotel comprises new luxuriously appointed hotel rooms, refurbished motel style rooms and spacious self-contained accommodation suites. The Whitsunday Terraces Resort is perfectly positioned in Airlie Beach making it your ideal holiday accommodation. It is nestled on a hillside overlooking the town centre and offers panoramic views of the Whitsunday waters and to the picturesque islands beyond. The Whitsunday Terraces Resort provides easy access to all of the major business and tourist attractions in Airlie Beach, which is what makes it the perfect self contained apartment accommodation for your next stay in North Queensland. The property also features numerous guest services and facilites such as lounge bar, business centre, conference centre, free car parking, guest laundry, restaurant, spa, outdoor swimming pool, tour desk, bbq facilities and daily housekeeping. With lots of interesting and exciting things to see and do in and around Airlie Beach guests who choose to stay at the Whitsunday Terraces Resort will be well positioned to see them all. This budget property provides business and leisure guests with fully self contained apartments that are spacious and well equipped, as well as great hotel facilities that add to your accommodation experience. The motel style accommodation at the Airlie Beach Motor Lodge offers families and couples seeking long or short stay accommodation in the Whitsundays the choice of motel rooms, studios and 2 bedroom self contained townhouses. Ideally situated in a great location the Airlie Beach Motor Lodge is within easy reach of all the major attractions that Airlie Beach has to offer. This along with the many guest facilities like direct internet access, disabled facilities, faxing facilities, free car parking, guest laundry, massage, sauna, outdoor swimming pool, tour desk, bbq facilities, garden, airport shuttle, baby cots available for families and daily housekeeping is what makes the Airlie Beach Motor Lodge such a great place for a relaxing stay. With lots of interesting and exciting things to see and do in and around Airlie Beach guests who choose to stay at the Airlie Beach Motor Lodge will be well positioned to see them all. Breakfree Long Island Holiday Accommodation in the Whitsundays, Queensland Australia. Breakfree Long Island resort is a magical island retreat located in the Great Barrier Reef Marine Park. Imagine having a holiday on a tropical island oasis - a beautiful palm-fringed beach surrounded by the sparkling blue waters of the Whitsundays, with Queensland's perfect weather. Imagine stepping out from your delightful accommodation to snorkel among the world renown tropical fish and coral of the Great Barrier Reef or to walk through a magnificent rainforest.